In less than 10 days since it put out a call to readers for donations, US music magazine Past has raised $175,000. The title, which already has around 200,000 subscribers, hopes a figure of $300,000 can be reached. Bloggasm’s Simon Owens asks whether the same model can work for other publications. This entry was posted in Editors' pick, Magazines and tagged funding model, Paste, readers, same model, Simon Owens, United States, USD on May 27, 2009 by Laura Oliver. 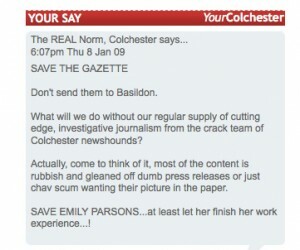 The story, ‘Lights in the sky From Gazette,’ has attracted some non-related UFO / Chinese lantern comments: ‘support’, of sorts, from readers for a call to keep the Gazette journalists in Colchester. But will it lead to a proper campaign…? This entry was posted in Job losses, Newspapers and tagged colchester gazette, newspaper, Newsquest, readers, uk journalism on January 9, 2009 by Judith Townend.